When Hermès launched their first Carre, Jeu des Omnibus et des Dames Blanches in 1937, there was no copyright to be found anywhere. 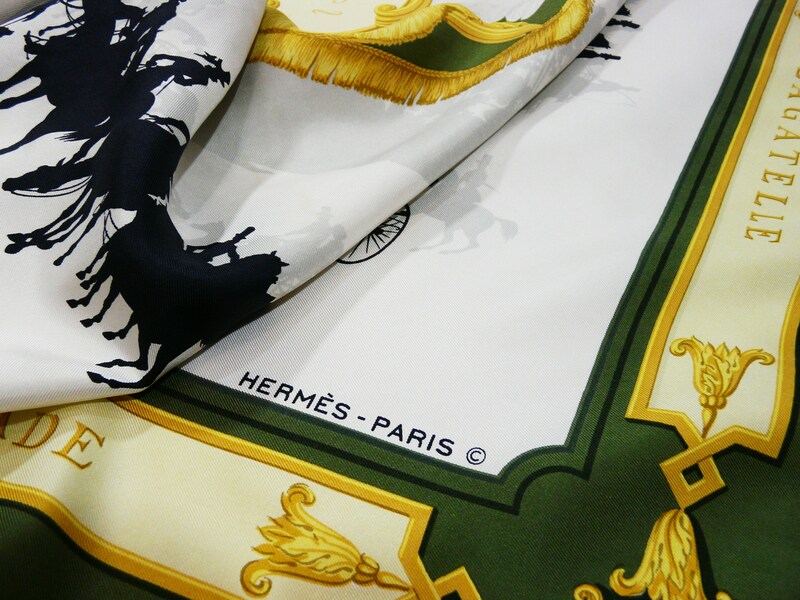 Although the copyright came about with the invention of the printing press in the 17th century and initially protected the rights of the printers, it subsequently evolved to protect the rights of the creator, the writer, the artist, but Hermès didn’t use copyright symbols until the late 1950s and even then inconsistantly until the 1960s. From that time on, however, the copyright morphed from a simple “c” or ©, to “Hermès – Paris ©”, and finally to the copyright we are familiar with used on modern carres, © Hermès. It is not unusual then to find the same vintage design without a copyright and subsequent re-issues with two or three different copyrights based on the re-issue date. Hermès first used a “c” or ©, which was either simply added to the design as with the Le Bois de Boulogne and the Quai aux Fleurs or was integrated into the design as seen in the examples below. Some examples of the integrated copyright. The integrated copyright can be found in many carres between late 1950s all the way into the 1980s. The Etriers below is a modern re-issue sporting not one, but two copyrights, the original “c” and the modern copyright used today. © Ladi and Carre de Paris, 2013. Unauthorized use and/or duplication of this material without express and written permission from this blog’s author and/or owner is strictly prohibited. Excerpts and links may be used, provided that full and clear credit is given to Ladi and Carre de Paris with appropriate and specific direction to the original content.